The F&D T-200X is one of the high-end luxurious home speaker you need to buy immediately.The speakers has excellent design combined with blinking LED backlights on the woofer which kind of looks nice. This is a 70W output speaker cost only ₦62,800.00. lets dive in for the review of the F&D 2.1 home speaker below. The F&D T-200X 2.1 Home speakers come with a large woofer. It looks absolutely beautiful. It is a luxury adding to your TV. The satellites are tall just like a sound bar. The overall device is made up of plastic. Even the woofer comes in a plastic body.The woofer has this light blinking all over its face and that looks really cool. The speaker grills are made out of metal which makes it strong enough. Talking about the connectivity’s all the woofer comes at the back side. There is a power on/off button. 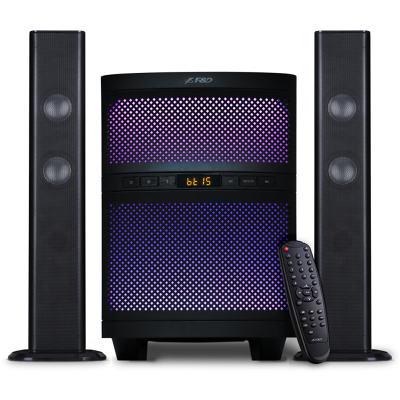 The speakers are mostly suitable for a television and DVD player. The overall design is lovely. The satellites have a small base stand which makes them stand perfectly without wobbling. The retail box consists of main unit, tower speaker x 2, manual, cables, remote, warranty card. The speaker looks decent enough with the black colored design. There are control buttons on the woofer. There is a small LED notification display. Where you can see the working mode. F&D T-200X is a 2.1 home theater speaker which consists of one woofer and two satellite speakers.It comes with 2-inch full range driver speakers and 8-inch subwoofer driver. The total sound output of the speaker is 70W. Provided 1-year limited warranty. The stereo jack is also available. The frequency response is 50Hz ~ 20kHz. It comes with Bluetooth connectivity with a range up to 10mtrs. Available USB card reader. The blinking colorful backlit looks amazing on this speaker. Talking about the 70W output, it is louder and sufficient for a large room. I can say that you can easily use for your home party. Enjoy the best sound quality with the F&D T-200X 2.1 luxury speakers. The speaker comes with an outstanding lightning woofer and it does give loud sound and makes you feel wonderful and your neighbors jealous. The price of the speaker is very less and affordable. The speaker is available at a Best price ₦62,800.00. The speaker is worth your money.